This is the final installment of my Tonight Show 25th anniversary series. If you missed them, Episode 1 discusses events Before the Show, and Episode 2 recalls The Day of the Show. Today's post follows up from late 1989 clear to the present. It is the longest and perhaps my favorite post, because it shows how this personal history has been woven through my whole life. Read about the publicity, the characters I've met, the book, and what it's all taught me. There's even a video of alphabetic banter with another TV god. The TV appearance happened immediately after I got to college, and it played a big part in defining me as an undergraduate. 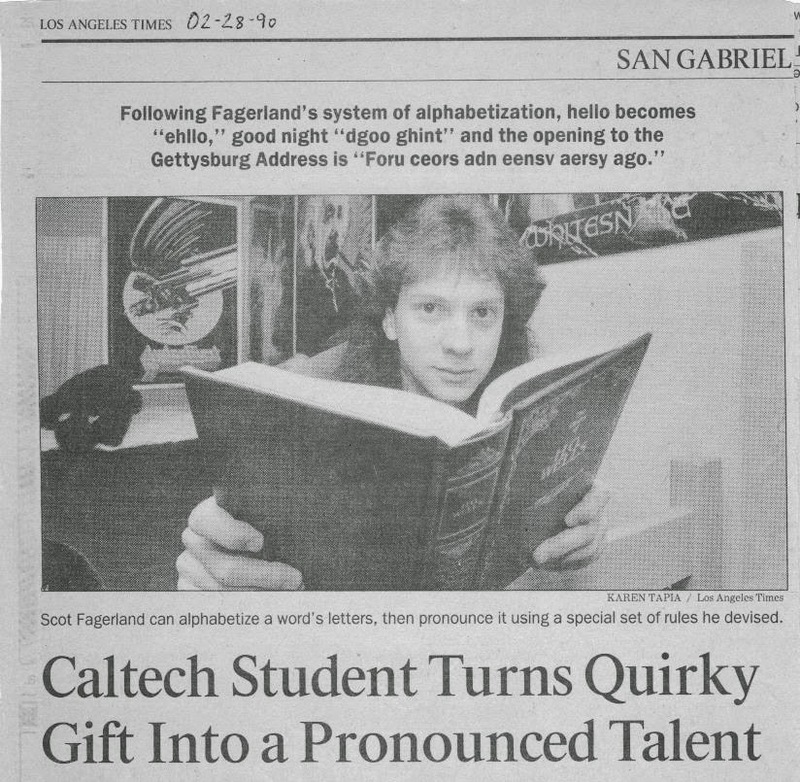 After an initial burst of media coverage, I was literally somewhat of a Caltech poster child for a couple of years. Some of the publicity and events were truly meaningful and memorable. Sometimes the attention got annoying. 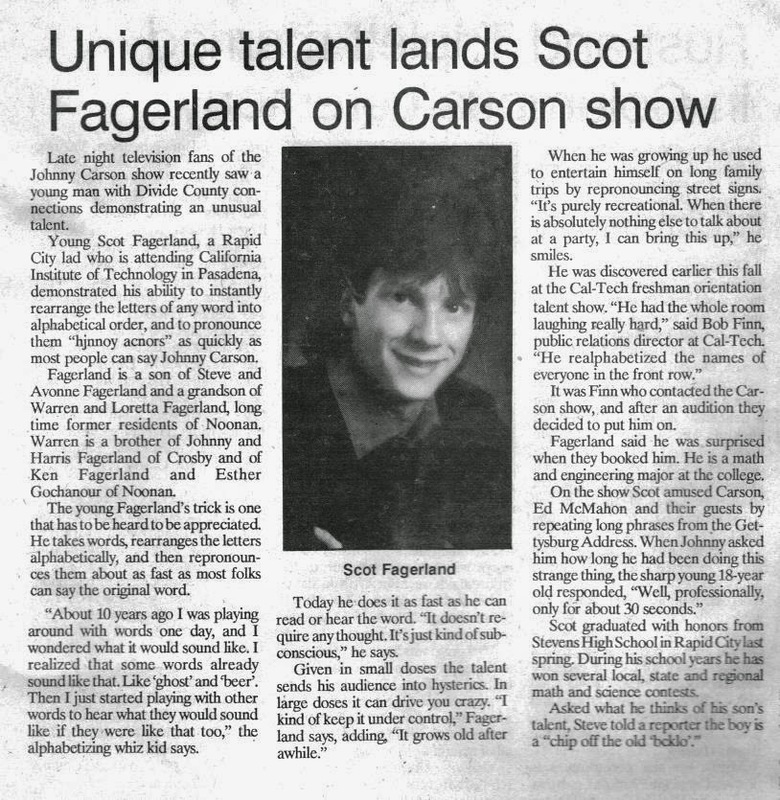 The fervor settled down by the time I graduated, though many people on campus, even strangers, still recognized me as "that guy on Johnny Carson." After college, I was ready to put that role behind me. The talent has been resurfacing again in surprising ways within the last decade. Only as I wrote this post did I truly appreciate how many enriching moments it has added to my life. I've dug through boxes of mementoes and tracked down a few rare souvenirs from various sources. It's good to finally have it all together in one place. The process has even led to some new memories. I apologize, Blogger is not good about formatting or allowing links within pages. Here is a table of the contents below, and you'll have to scroll down to find a particular passage. Several newspaper articles followed the show in short order. These numerous "home town" articles, as well as those in the Rapid City Journal and Pasadena Star posted earlier, prove that I am truly a Calikotan! Cavalier County Republican (ND), 12/04/89, front page. My cousins Molly, Kassie, and Anthony Zimmer are watching me on TV. Crosby Journal (ND), 12/06/89, p. 6. Unknown article, apparently from a North Dakota paper. Click here to view. Caltech News, Feb. 1990. Click here for complete article. Los Angeles Times, 2/28/90, San Gabriel Valley section. I heard a rumor that Larry King was interested in an interview too, but that never materialized. Orthography: "The part of language study concerned with letters and spelling." (dictionary.com) Apparently, there is a small world of hobbyist orthographers who get excited about letter patterns. I learned about a few and heard from some of them. A professor called me with his unchallenged discovery that "billowy" is the longest alphabetized word in the English language. I told him about what I believed to be the last alphabetized word in the dictionary. It's "sty," or, if you consider it a full word, "tux." I believe your talent is shared by Jerry Lucas (see The Memory Book, by Harry Lorayne and Jerry Lucas). Have you been in contact with him? Can you also arrange words in anti-alphabetical order? The longest naturally anti-alphabetized word I can think of in English is "wronged." To answer Dave's question, no, I am not very good at arranging letters backward, and that would include anti-alphabetizing. The most interesting call came from someone that I only knew at the time as "Dr. Geller." Here are my journal excerpts describing that contact. JPL is a Caltech / NASA lab fairly close to campus. I got a call today from a guy named Dr. Geller from JPL. He said he heard of my alphabetizing ability but that he’d done me one better – he’d put the same skill to semi-purposeful uses. He can’t do it instantaneously like me, but he’s “wondered” a lot about words – the longest with the letters alphabetically arranged, the longest palindrome, words containing consecutive letters, etc. So he went through a huge dictionary of 258,000 words and alphabetized them all over a 3 - 4 year period in all his spare time. He then wrote a book about letter “trends” of 210 pages. He said he’d like to see me and to offer me a copy of his book (which has never been published). He also said there’s a nationwide society of about 650 people who do the same thing. He told me how to find him at work, and I told him I’d try to see him sometime over Spring Break. That should be interesting. I went to see Dr. Geller. ... He presented me with, and briefly went over, his book, “Our Fabulous Language: The Alphabet Dictionary.” Pretty fascinating stuff! He said he wants to get together with me some other time (he’ll come here next time) to “discuss it further;” he seems to think that he and I would make a good team for something linguistics related. If he gave me a copy of his Alphabet Dictionary manuscript, I don't remember it directly, and I don't know what became of it. Apparently, it never did get published. I remember his lending me a lexicographic journal that he said he would need back. I felt guilty for years because I never got it back to him, and then even worse, I lost it and lost touch with him too! Right now, during the writing of this post, I got curious to look up his whereabouts today. It gave me a weird feeling to find his obituary instead. His first name was Murray or "Mo," and he just died a year ago. The obituary paints a very colorful picture of him and corroborates my impression that he was "eccentric," a word that even his family used. Thanks for making me part of your long strange trip! 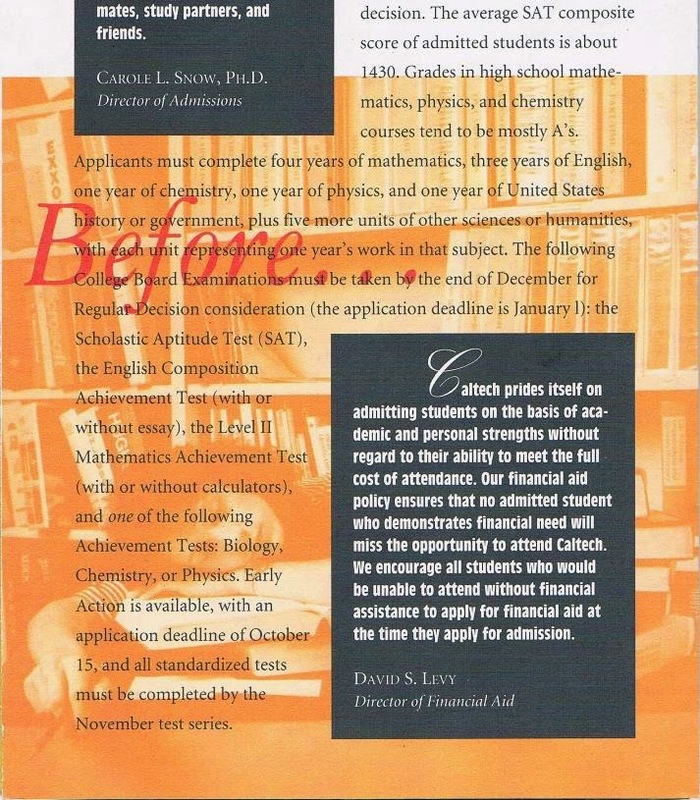 Caltech once sent out a pamphlet called "100 Reasons to Choose Caltech" for prospective high school seniors. They chose me as the student to photograph sleeping at school ("Before") and then sleeping at work ("After"). I did two or three such projects for the school. They didn't expressly say that they chose me because I was on TV, but I'm sure that's how they knew me. I heard that they also included part of my Tonight Show clip in the admissions office's promotional video. This was played for visiting applicants and their families at campus visits. One incoming freshman even joked with me that my video was the reason he'd come to Caltech. Of course, that was the college's motivation behind putting me on! As luck had it, I was at Caltech when the institute celebrated its centennial in 1991. There was an official centennial banquet on March 11, at the Beverly Wilshire Hotel. The event was quite exclusive. The hall was filled mostly with prominent professors, administrators, and a few Nobel laureates. I was invited not only as a Glee Club member (we sang a god-awful chorus written for the occasion) but also as one of five student speakers. Our celebrity MC was Walter Cronkite. I'd been sent a tentative copy of the script they'd prepared and it seemed terribly corny. 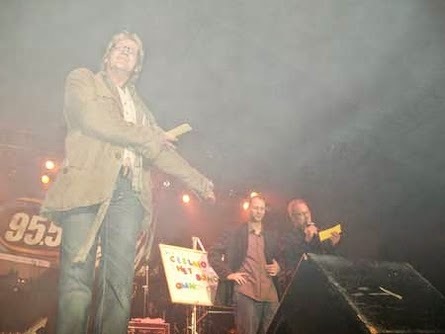 (They wanted me to walk around the audience and do my "boffo little number" with my "characteristic unshakeable dignity" and then take the podium from Walter Cronkite, alphabetize his protests, and then "bounce off stage.") Yeah, right. That's where this video picks up. (And uggh, even more hair than before). On the ride back, I invited Dr. Everhart to Ricketts dinner. Caltech President Thomas Everhart actually accepted my invitation to dine with the undergrads. He sat next to me at the Ricketts House head table. After dinner, he announced for the first time that he had secured President George H.W. Bush as Caltech's centennial commencement speaker! Bob Finn called today and informed me that CBC is interested in conducting a phone interview with me as part of a radio program about memory. A guy from CBC called me later and filled me in a bit more. CBC, in conjunction with National Public Radio, is producing an 8 or 10 part series on the mind. One show will be dedicated to people with "extraordinary abilities" (like me!) They want to send a man to my room to record my end of the phone conversation here. The interviewer asked me the standard questions: "How do you do that?" -- I gave the most complete answer I've ever pulled together for that question -- "Are there any useful offshoots?" "Do you possess any other extraordinary talents?" and then, of course, he read me a Canadian poem line by line and had me repeat it in my language. The interview was recorded, not live. There was no set date for the broadcast. Back in those days, it was much harder to stay apprised of things like that! Consequently, I never heard the program on the radio. I am sure it aired, though. I got a call from an old high school friend a few months later, who told me that he'd just heard the interview. He just corroborated this memory in 2014. However, this program has proved to be the only material that I can't track down. I've spoken with archivists at CBC and NPR who said they have no records of such a show. NPR's older material is scattered around the University of Maryland, Library of Congress, and National Archives (seriously). This sent me on a wild goose chase when I was in Washington, DC at Christmastime. I still came away empty-handed. This recording might be lost forever! I do have one more clue to follow, though, so it may be a continuing quest. Johnny Carson announced his retirement in 1992. To pay homage, my then-girlfriend Sharon and I went to see a live taping of one of his last episodes. It was April 9, 1992. I remember clearly that his guests were James Woods, Ted Koppel, and Stevie Wonder. To get tickets to the show, I had to drive to Burbank early in the morning and stand in a long line. After four decades on the air (three on The Tonight Show), Carson was still a hot ticket. He went out on top. I also made sure to tune in to his very last episode, just a month later on May 22. That was a retrospective "best of" episode, with no guests. My clip was nowhere to be seen, even in his special segment of civilian guests. His repertoire was vast, my appearance only a very insignificant part of it. That's how fortunate I was to meet him, though. If my talent had been discovered even at the end of my college years, it would have been too late. In Carson's last few years, too, he took a lot of time off and was substituted by numerous guest hosts. If I had been on air even one day earlier, it would have been with Jay Leno. It's no doubt that the attention I received for my appearance was due 1% to myself and 99% to the forum of the Tonight Show and the popularity of Johnny Carson. That is attested to by this touching clip, his last TV appearance ever, two years after his retirement. After that, Carson quietly faded away. We heard from him no more until the newspapers announced his death in 2005. Even that came and went without much fanfare, because he had been out of the public eye for so long. Ed McMahon's and Walter Cronkite's deaths both followed a few years later in 2009. Watching my Tonight Show clip has taken on new significance for me since then. I see myself sitting between two ghosts. By the '00s, I had hardly thought about my Tonight Show appearance in years. It started to feel more precious to me when it hit home what once-in-a-lifetime really means. 2009 was a tough year for me. I had been teaching at public colleges for years, and suddenly that work disappeared amidst the Great Recession. I had to relocate to a less expensive neighborhood and start over from scratch. I was unemployed for months and basically penniless at one point. This is a story from that time that I have never told before. 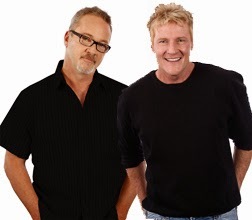 I was a long-time fan of the local radio morning talk show Mark & Brian (1987 - 2012, based in LA and syndicated to several stations throughout the western US). That summer, they announced an event called the Bongo at Morongo. It would be a concert, bikini contest, and "freak of nature" talent show out at a casino in the desert. The winner of the talent show would receive a trip for two to Hawaii! Desperation drove me to try out. I figured that if I won, I could sell the trip to Hawaii and use the cash to help get back on my feet. They weren't looking for classic talents like singing and dancing, but "freak show" kinds of behavior. It seemed like the perfect opportunity. I called the station and was lucky enough to get through to Mark and Brian. I went on the air with them for two or three minutes and explained what I could do. It took them a while to understand it, but they were intrigued. "That isn't particularly entertaining," Mark opined, "but you certainly are a freak of nature!" After a few more days of call-in auditions, they narrowed their field down to the top ten contestants, and I was one of them. I was invited to come to the event and compete in the talent show before a live audience of thousands. This would turn out to be my largest live audience ever. It was quite a talent show. There was a guy who could cut cardboard boxes with his bare hands like a knife, a guy who could smoke an entire cigarette in two long puffs, and a few other acts like that. My favorite part was meeting all the radio personalities backstage, voices that I heard every morning. I was seated next to Kelli Gates, their newswoman, who was particularly approachable and conversed with me for several minutes. After all the contestants performed, we were all called out and the winner was announced. And the winner waaaaas .... not me. The prize went to a married couple. The bald husband was able to stick the bottom of a half-empty beer can to the back of his head like a suction cup. Then he tipped it back and his wife drank (or attempted to drink) from it. My appearance at the Bongo did not generate any of the rave feedback I'd gotten last century. The audience was larger and more removed from the stage than the earlier talent shows; I did not interact with them. The crowd, a very working-class demographic, was more interested in the beer and bikinis than orthographic tricks. As I ate in the casino afterward, I saw a very attractive girl that I'd noticed before, and was excited that she asked me to demonstrate for her. Her friends got tired of it, though. Afterward, this was a forgotten act. It's amazing what a difference the venue can make! Nevertheless, I am proud of this accomplishment because I did it without any reference to the Tonight Show. And I had a great evening, which is what really matters. In 2008, I got an email out of the blue from a psychiatrist named Dr. Darold Treffert. I didn't realize it, but he had been part of my public appearance since the very beginning. 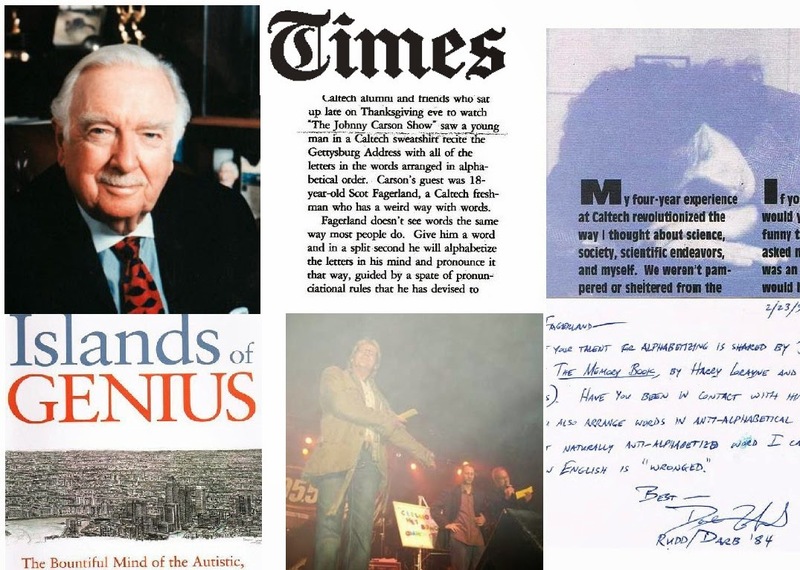 He'd been the doctor interviewed by the newspapers in 1989, the one who'd said that 80% of people with savant abilities have mental deficiencies, whom I'd then quoted on the air. Dr. Treffert wrote, "because of my work on savant syndrome I am interested in normal persons like yourself who have such special, but quite rare skills." He added, "I have, through the savant syndrome web site (www.SavantSyndrome.com) know now of several other very normal, very bright persons like yourself with similar abilities (instantly counting the number of letters, or vowels in a sentence for example). But it is still a rare ability." He was interested in asking me a few questions through email, and I was glad to participate. As it turns out, he was writing a book based on his life's research. He included me in one chapter, and was considerate enough to send me the first draft of the chapter for feedback and recommended revisions. The book was published in 2010. It was called Islands of Genius, referring to the mental seascape of someone whose mind may be largely submerged, but with a few islands of clarity or genius. Dr. Treffert has studied the lives and minds of many autistic savants with extraordinary abilities, including many that he's met. He was a consultant to the movie Rain Man. 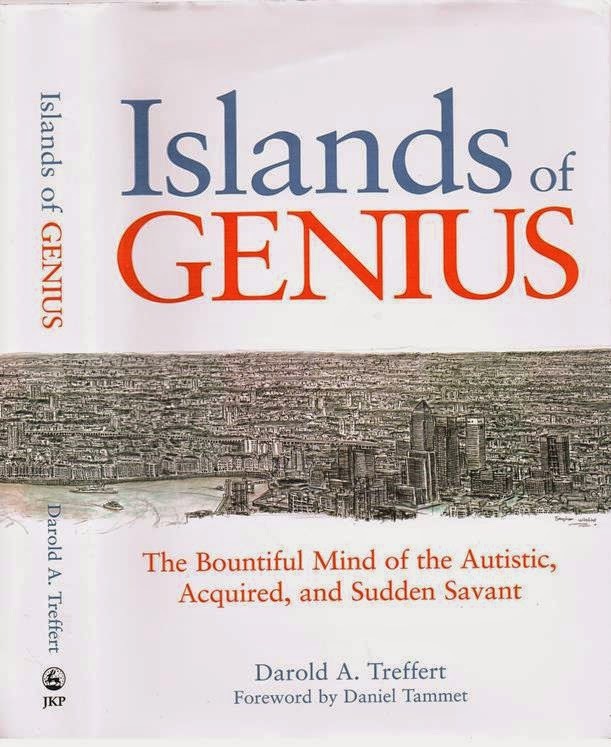 In Islands of Genius, he profiled several autistic savants with unbelievable capabilities, and showed a common thread running through their stories -- supportive and proud parents. A surprisingly touching book, it has already won two medals since its publication. I recommend it if you are interested in the subject. With the author's permission, here for my friends and family is the excerpt where I am featured. I didn't even have my own copy of the Tonight Show episode for decades. For those of you who remember the 20th century, we didn't have multimedia flying around in every direction back then. My parents had a tape, and I watched it once every few Christmases when they played it for guests. YouTube has been around since 2006, but I never recorded many home movies and just didn't jump on that bandwagon very quickly. In 2012, a particular YouTube video went viral. It was a teenaged girl who could pronounce words backward. I started getting Facebook comments about it. It reminded old friends of my ability, and they were wondering if they could find my TV clip anywhere. Well, I figured, I might as well post it. I got Mom to mail me the old VHS. My high school friend, Sean Coyne, digitized it and posted it to his YouTube account. I referred to the new video clip on my Facebook profile, where a few old friends reminisced about it and were able to show it to their friends and families. Over the next few months, a few present-day acquaintances of mine stumbled on the video too. For example, some clients were searching for my tutoring website, so they Googled my name and found the video on YouTube. This completely caught them by surprise. I hadn't told new friends about that incident for decades! I was embarrassed and frustrated by the new 21st century reaction. Instead of saying, "What a unique talent" or "What was it like being on the Tonight Show?" my new friends' first reaction was to make fun of my 1980's clueless-teenager hair instead. I even thought about taking the video down because people were missing the point. In the end, I decided to keep it there and just tough it out. Now that I'm middle-aged and balding, my hair is still embarrassing anyway. Fortunately, a few new friends have been entertained. They've asked me about the situation and asked me to alphabetize for them. It's a good way to keep it alive for old time's sake and a new generation of friends, without having to bring it up myself everywhere I go. On November 22, 2013, the 24th anniversary of the show, I posted a version of the video to my own YouTube profile. This time, I enhanced it with text annotations to offer some behind-the-scenes commentary and to spell out what I was saying. That is the version that I prefer friends and family to watch. Sean's copy is still more widely viewed, with 1,000 views as compared to 500. The girl who spoke backward got over 2,000,000 views! What can I say; she's very impressive and a lot cuter than me too. I won't ever be able to profit from my clip, because technically it is NBC's property. As yet another spinoff of this very blog series, my YouTube video was recently tweeted by Caltech's official Twitter account! I got 100 views that very day. This decade, I have actually had phone conversations with two other alphabetizers. They both gave me permission to recap our discussions here and to use their real names. Both ladies are socionormal (somewhat to my surprise), and we had good conversations. There is something oddly comforting about finding your own, like people who share an obscure interest. It's fascinating to see the secret workings of your own mind manifested in someone else. It was especially intriguing to find out how our thought processes are similar and how they’re different. Camilla Morrow of Canada was featured in the same chapter of Islands of Genius as myself. Her alphabetizing habit is more complex and even more remarkable than mine in some ways. It comes in three steps. (1) She alphabetizes the letters in an entire short sentence, not just each word! For example, the sentence “Is she all right?” would be wholly alphabetized as “AEGHHIILLRSST.” By contrast, I only alphabetize individual words. (2) She mentally eliminates the repeated letters! 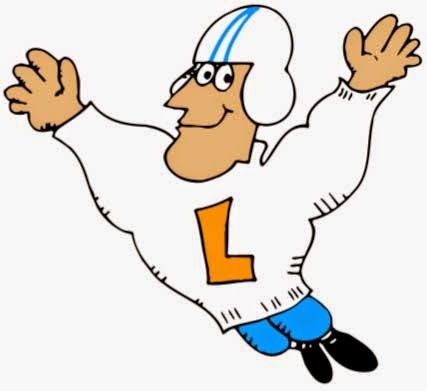 Here, the letters H, I, L, and S are repeated, so she would strike them out and be left with the letters “AEGRT.” As I have mentioned, I have more trouble identifying repeated letters. However, I'm sure that alphabetizing makes it much easier to do so. Camilla's first orthographic interest came at age 7 or 8, but it was not alphabetizing. She would count the letters and syllables in words, phrases, or sentences to see how “balanced” they were. From there, she became interested in single letters vs. repeated letters, and developed her current word game later in her life. So hers is a gradually evolving habit, a process that required active practice to develop. She doesn’t think of it as a “gift” that came automatically, though you have to admit that nobody else (including me) can do what she does. Camilla said that the hardest thing for her (and the main reason she wanted to talk to me) is that she can’t block it out. “It’s like a computer in my brain, and when my mind gets a hold of a good one, I just can’t ignore it!” She said that it gets really distracting sometimes. She asked me if that is a problem for me too. Sometimes I'll do it semi-consciously when my mind is idle, but not when I'm concentrating on something. I think Camilla was hoping I’d give her insight about how to “turn it off,” but I couldn’t answer that. Just last month, by sheer coincidence while I was preparing this blog, I heard from Magdalen "Maggie" Daheim of Washington. Maggie contacted me on Facebook to say, “I have the same ability as you.” Interestingly, she also had a burning question that she hoped I might answer. She wanted to know "how we do it" and whether her son might inherit the ability. I felt like a bit of a letdown again, because I couldn't answer her questions either. Maggie's memories mirror mine in many ways. Her mother read with her a lot as a preschooler, like my Mom did. Maggie began alphabetizing so young that she doesn't even remember life without it. When she was between 5 - 10 years old, she was in the backseat of the car and suddenly started spelling the road signs in alphabetical order. It took her parents quite a while to understand what she was doing, and they couldn't believe it. That is a famous episode in my family too. Like Camilla, Maggie will alphabetize either words or full short phrases / sentences. She sometimes adds a twist too. In her mind, certain letters or combinations of letters have more value than others. Sometimes she will replace a true spelling with a more "valuable" one. There is no rhyme or reason to her value system, she said. The example she used was the word "Samsung," which alphabetizes as "AGMNSSU." Maggie's mind tells her that since S is repeated, one of the S's would be more valuable as a vowel that is not already in the word, like O. That transforms the word to "AGMNOSU." Interesting how she and Camilla both pick up on repeated letters like that. Alphabetizers tend to be attracted to order and patterns. In addition to these two, I have heard of a handful of other documented cases. Camilla and Maggie have directly corroborated my hypothesis that our talent is correlated to early language skills. All alphabetizers that I've ever heard of are English speakers. Even this small club has our idiosyncrasies. Though someone like Camilla can alphabetize longer phrases and count repeated letters better than I can, I am faster. Another difference is that all the other alphabetizers spell their results. I seem to be the only one who pronounces them. "How would you say 'house'?" I asked Maggie. She recited the letters, E-H-O-S-U. I've always thought it seems more natural to say it phonetically as the word ehosu. I think that the pronunciation also provides an extra touch of entertainment value. Spelling just doesn't sound as funny, and wouldn't make compelling TV. It's easy to find me or Maggie on Facebook, and we both welcome any other alphabetizers to look us up. Attention is a scarce and powerful resource. Advertisers, artists, politicians -- they all vie for it because it can make a huge difference. The Tonight Show experience provided me with firsthand knowledge of how colossal the national media is. I was on air for only four minutes. Those 240 seconds are the most publicly known moment of my entire life, and they practically define "who I am" for most people who don't know me well. That moment led to months of newspaper coverage, recognition throughout college for four years, and scattered references even decades later. Even with mere "public exposure" as opposed to fame, even without anything profound to say or popular to offer, I still had to get used to strangers knowing who I was. It changed my perspective of what is possible. 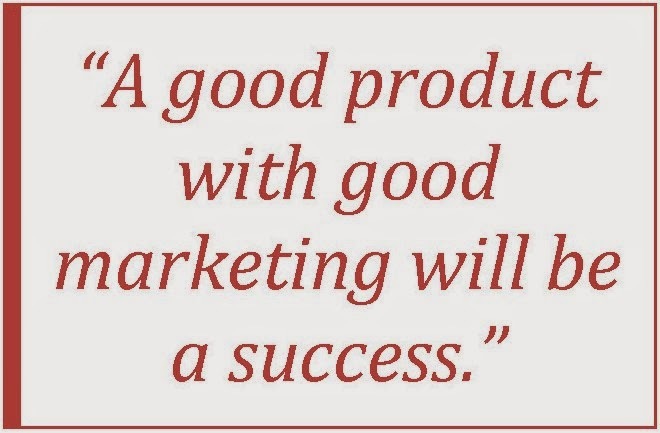 This has led me to the conviction that a good product with good marketing will be a success. If my businesses got four minutes of national exposure, it would make my career explode! That's why Superbowl ads are worth over $100,000 per second. Of course, we know that not all promotions produce hits. This proves that media can only get attention; it can't keep attention. If a national campaign fails, it probably indicates that the product isn't very exciting. You can get a pretty good idea of your product's potential from the local reaction. For me, my camp talent shows were the proving grounds to demonstrate that I had an act that people wanted to watch. Publicity just magnifies your local reaction. I took this to heart later in life as an instructor. I could tell from my first few classes that I was doing something that worked for the students. I have now taken advantage of that as an entrepreneurial tutor with a growing referral network. As a fledgling musician and writer, I can also gauge which creative projects are worth publicizing. 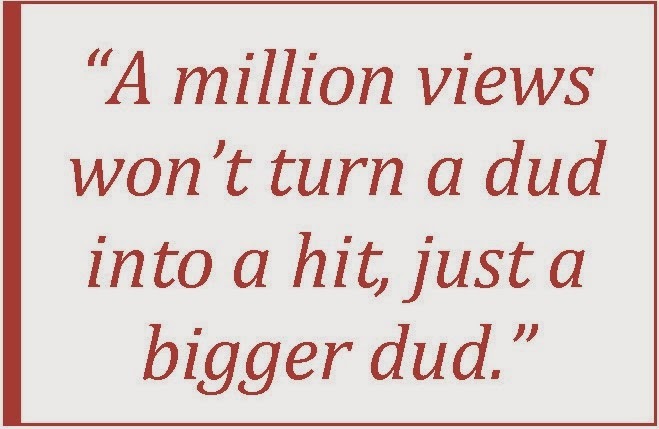 A million views won't turn a dud into a hit, just a bigger dud. "You only have to get famous once. Then you are famous." I wish I could remember who said that. Anyway, the same goes for any kind of publicity or attention. It sticks in people's memory and lends you their ears. It can provide you with a known platform to stand on. Before too long, I found that publicity has its downsides too. The worst part is that it creates a fixed role for you in people's minds, and they expect you to play that role on demand. It even begins to feel like you're a commodity for others, a very odd feeling. People want you to perform for them on the spot. They want you to be funny or ingenious or intriguing. Publicists are inherently interested in exploiting your talent for their own benefit. Sometimes, they want you to modify what you do, and do it their way. If you want to be publicized, you'll have to give up some autonomy. If you want to be famous, you'll have to give up privacy and probably some dignity too. You can't force success. At age 18, I had been back in LA County for only two months and had already stumbled onto The Tonight Show by accident. I often think of all the aspiring actors who come to LA desperate to get on TV. They sacrifice everything for years, and most never make it to major networks. Unfortunately, it isn't burning desire that gets you into the spotlight. You have to offer something unique that people want to see. It also has to be something that publicists want to hold out. The interaction between artist and audience is the visible and exciting part. 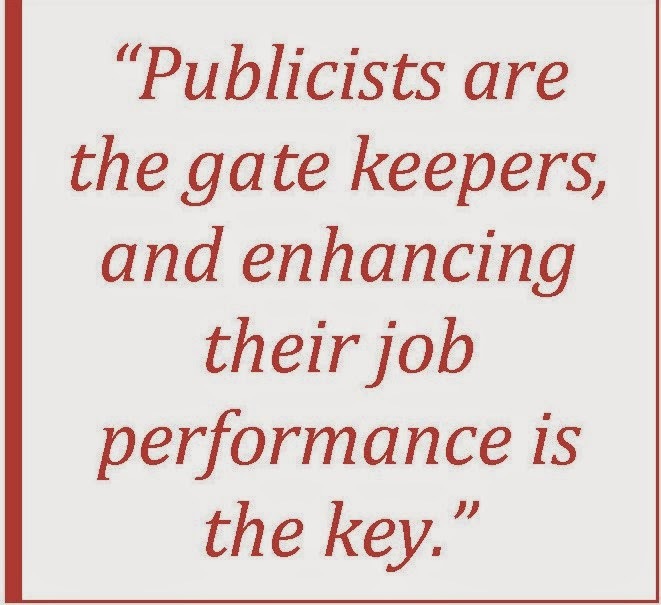 But publicists are the gate keepers, and enhancing their job performance is the key. I was propelled by Caltech's desire to recruit applicants in a creative way. The Tonight Show accepted my act because the introduction would entice people to stick around to the end of the broadcast and watch all the ads. Hell, even the Beatles got on Ed Sullivan because Bayer believed it would help them sell some aspirin that night. But ultimately, the value was derived from the "content," the fact that people were entertained. My Tonight Show memory lives on because it makes people laugh for a few minutes. That's something I can feel good about. If the owner of any image on this page objects to the use of the image, please let me know and I will remove it immediately. I make no money whatsoever from this blog.